Another DELICIOUS dessert for the holidays and another other day of the year. Because I mean…who doesn’t like chocolate!?! 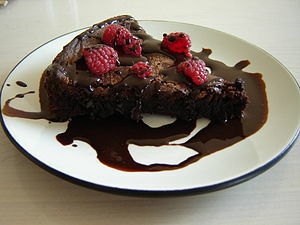 The chefs at Whole Foods Market have done it again with this wonderfully sweet and satisfying flourless chocolate cake. If you enjoy the flourless Chocolate Dome at P.F. Chang’s China Bistro (try it if you haven’t! ) then you’ll LOVE this decadent dessert. So head to the kitchen, eat a few chocolate chips while you’re making it and remember…sharing IS caring – even if it is too good to share. Meanwhile, make the chocolate glaze. Melt remaining 4 ounces chocolate and 3 tablespoons butter in a small saucepan over medium low heat, stirring until smooth. Remove from heat, then stir in rice milk (or almond milk), honey and vanilla. Set aside to cool slightly.